A concussion is caused by a blow or a jolt to the head that results in a change in brain function. This can include symptoms of headache, dizziness, and confusion or disorientation. Symptoms of a concussion may last less than a day but it is not uncommon for children to have symptoms for a week or more. Most of the time, however, there are no lasting effects from a concussion, especially when it is correctly treated. Treatment should include rest, symptom management and a carefully guided return to activities. This is especially important for teens and children, as the brain of a young person is continuing to develop and needs to be conservatively managed. Get the facts about concussions in our FAQs. Is it a concussion? Look for these signs and symptoms. CHOC’s Concussion Program includes concussion-trained pediatricians, neurologists, neuropsychologists and neurosurgeons, as well as physical, occupational and speech therapists. Together, we partner closely with area coaches, school nurses and community providers to evaluate every child and teen who experiences a hit to the head. Most concussions are not severe, but they should still be taken seriously. They are best treated by a pediatrician with experience in concussion management. If your child or teen has symptoms of a concussion, talk to your pediatrician. CHOC also offers training for community pediatricians to learn the latest protocols in managing concussion in young patients. Please call 714-509-4291 for more information about provider training. For children and teens who have severe concussions or symptoms that aren’t improving (post-concussion syndrome), we offer a higher level of care through our neuroscience team. Patients seen at the CHOC Children’s Neuroscience Center receive comprehensive treatment from our pediatric neurologists, as well as our pediatric neurosurgeons for injuries that may require surgery. The neuroscience team also includes pediatric psychologists who use specialized testing to determine the extent of brain impairment and recommend a custom plan for cognitive recovery. For athletes who don’t have a history of concussion, our specialists use a computer-based tool called ImPACT® to establish a baseline of cognitive function. If an athlete then sustains a concussion, we are able to monitor the patient’s recovery by measuring attention span, memory, processing speed and reaction time, and comparing it to the patient’s baseline information. Ongoing symptoms of concussion may be best managed with physical, occupational and speech therapy. Our rehabilitation team has unique experience treating patients with concussion and is ready to help overcome any problems your child or teen may be experiencing. Learn more about our concussion rehabilitation services. Our concussion team partners with high school sports programs to mentor coaching staff and help manage an athlete’s post-concussion care. We also have developed recovery guidelines with tips for school staff on returning students to school, sports and activities after concussion. Our pediatric-dedicated emergency department is equipped and ready to treat any child or teen who sustains a concussion and requires immediate medical attention. The CHOC Concussion Hotline is a resource for coaches, trainers, physicians and medical providers to consult with a pediatric neurologist and to coordinate an appointment for their athlete or patient. Our concussion experts provide immediate response, even on nights and weekends. Please call 714-509-4054 and press 1 for the Concussion Hotline. Please note the Concussion Hotline is not intended for patients and families. Learn more about making an appointment here. More than 90 percent of concussions heal fine if managed well in the first days to weeks following the injury. Rest is important immediately following a concussion. For 24-48 hours after the injury, your child should stay home from school and get plenty of quiet time and mental rest. This includes limiting activities like television, texting, social media, reading, doing homework, driving, attending loud events and social interaction. Download our complete Road to Recovery guide here, or view recovery recommendations below. Most children should be able to tolerate some school or even full days of school after a few days. However, returning a student to school while they are still experiencing symptoms can result in learning problems and poor academic performance. Too much cognitive exertion can lead to headaches, problems concentrating, fatigue and trouble with emotional control. The student may feel overwhelmed or irritated. So, when is the right time for a student who had a concussion to return to school? A health care professional can help offer guidance following an evaluation. The school must be notified that the student with a concussion is returning, so the student can be observed and monitored. Schools may need to make some short-term adjustments for a returning student, as he or she recovers, so the brain is not over-taxed. It’s normal for the student to feel frustrated, embarrassed, isolated or sad, particularly as there are often no outward signs of injury, so have the school psychologist or counselor talk to the student if necessary to offer support and encouragement as needed. View the six stages for returning a student to school after a concussion. •	Do some classes or tasks at school, such as looking up or down to take notes, cause the student greater difficulty than others? •	For each class, is there a specific time frame after which the student appears fatigued? •	Does the student have a harder time concentrating after a certain amount of time or as the day progresses? •	Do specific things at the school or in the classroom distract the student? •	Are any behavioral problems linked to a specific event or setting, such as loud noises in the hallway or bright lights in the cafeteria? •	Adjust the student’s schedule as needed to avoid fatigue, such as a shorter school day, reduced course load or holding the most challenging classes earlier in the day. •	Adjust the environment to reduce distractions or protect the student from irritations like bright lights, talkative peers and loud places. Move the student closer to the teacher. •	Give the student extra time to finish classwork and take tests. •	Help the student create a to-do list or get organized. •	Give the student assistance: assign a peer to take notes for the student and/or allow the student to record classes. •	Break down assignments into smaller chunks and offer recognition cues. •	Provide alternate methods for a student to show mastery of a subject, such as allowing a multiple-choice or verbal test vs. an essay exam. •	Focus on what the student does well and expand the curriculum to more challenging content as symptoms subside. •	Adjust school load to prevent “piling-up” of assignments. •	If the student is frustrated with failure in one area, redirect him or her to other curriculum areas where he or she can succeed. •	Reinforce positive behavior and academic success. •	Provide structure and consistency; make sure all teachers use the same strategies. •	Remove a student from a problem situation, but don’t characterize it as a punishment. •	Involve the family in any behavior management plan. •	Acknowledge that the student may be having a hard time. Be empathetic, encouraging and patient. •	Have the student work with you to make decisions about schedule changes or prioritizing tasks. •	Irritability, low frustration tolerance or “short fuse” are common. Approach student in a non-judgmental way. When it comes to returning to sports, symptoms must be resolved first. Be sure to get medical clearance from your child’s doctor before they get back in the game. Final clearance is determined by a health care professional and will be based on test results, evaluations and the athlete’s ability to tolerate the return to activity. The student will be monitored for returning symptoms during each step along the road. Retirement from contact sports should be considered for any athlete who has sustained multiple concussions or who has suffered from prolonged post-concussion symptoms. Even in patients having suffered a single concussion, it is important for the athlete and the family to understand the risks of participating in contact sports and activities. View the six stages for returning a student to sports and physical activity after a concussion. In this segment of American Health Journal, Dr. Grace Mucci, neuropsychologist at CHOC Children's, explains the symptoms of a concussion and how to manage them. In this CHOC Radio podcast, Dr. Sharief Taraman speaks on the topic of concussions in sports, their long term effects, and how children are particularly vulnerable to serious injury. In this segment of American Health Journal, CHOC neurologist Dr. Sharief Taraman and CHOC neuropsychologist Dr. Jonathan Romain explain what happens to the brain after concussion. Learn more about kids and concussion. Answers questions slowly or repeats questions. Seek emergency care immediately if your child or teen has experienced unconsciousness for any amount of time or has changes in alertness, convulsions or seizures, muscle weakness, persistent confusion, repeated vomiting, unequal pupils, unusual eye movements or walking problems. How can concussions be prevented or avoided? 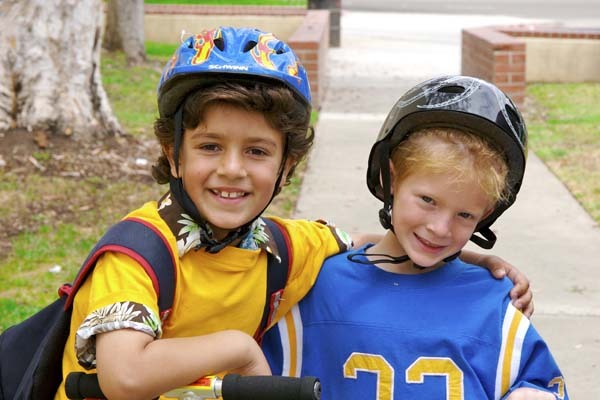 You should always wear a helmet while riding a horse, motorbike, bicycle, skateboard or snowboard, or while playing contact sports like football, hockey and lacrosse. Although helmets cannot prevent a concussion, they do protect from more severe traumatic brain injury and skull fractures. Helmets should fit appropriately and be in good condition. In sports, student athletes should be taught safe playing techniques, equipment maintenance and to follow the rules of the game. Also, every athlete should know it’s critical for them to tell their coach, athletic trainer or parent if they have hit their head or are experiencing symptoms of a head injury, even if it means stopping play. Young athletes and children should NEVER ignore a head injury or impact to the head. How can I help my child or teen recover completely? Parents often face challenges keeping active kids quiet and resting but this is very important. Insist that your child get plenty of sleep, quiet time and rest, immediately after a concussion. Limit mental and academic stimuli as well as physical activity. This includes limiting everything from television and texting to reading and doing homework. Your child should avoid loud events like sports games, practices or parties. Help your child to decrease stressors because concussions tend to magnify pre-existing conditions, especially the stress that student athletes are under to perform in the classroom and on the field. Also, don’t let your teen drive until a physician says it’s okay because a concussion usually slows reaction time. Can a concussion lead to a more serious medical problem? Yes. The most significant complications associated with a concussion are brain swelling and increased intracranial pressure. If left untreated, this pressure can cause brain damage by preventing blood and oxygen circulation throughout the brain. Furthermore, a student who suffers a second impact or consecutive concussions without a full recovery in between each concussion is at risk for more serious or long-term complications. We recommend a timely follow-up with your child’s pediatrician if they have experienced a minor concussion. If your child or teen does not have a pediatrician or primary care doctor, find one here in our directory. When concussion is severe or symptoms won’t go away, talk to your doctor about a referral to the CHOC Children’s Concussion Program, which offers pediatric sports medicine specialists, neurologists, neurosurgeons, neuropsychologists and rehabilitation therapists who are all trained in concussion management. Please call 888-770-2462 to schedule an appointment with a CHOC specialist. A referral from your child’s pediatrician or primary care doctor may be required.